Enriched in organic Aloe vera juice, this milk removes make-up and impurities effectively. It leaves your skin soft, clean and hydrated. 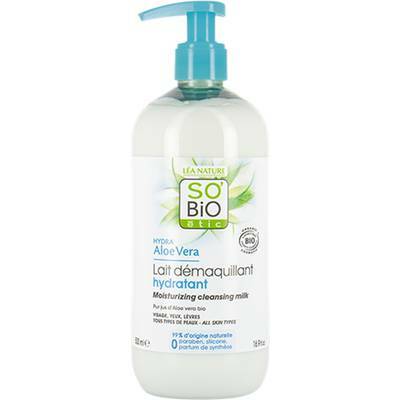 Formulated with: Moisturinzing organic Aloe vera juice, moisturizing and protective vegetable Glycerin. Use: Apply to the whole face, neck and eyes, using a cotton wool pad. Aqua/Water/Eau, Helianthus Annuus (Sunflower) Seed Oil*, Isopropyl Palmitate, Glycerin, Caprylic/Capric Triglyceride, Cetearyl Alcohol, Glyceryl Stearate Citrate, Olus Oil/Vegetable Oil/Huile Végétale, Aloe Barbadensis Leaf Juice*, Benzyl Alcohol, Bentonite, Parfum (Fragrance), Sodium Cocoyl Glutamate, Xanthan Gum, Sodium Benzoate, Sodium Levulinate, Sodium Chloride, Aloe Barbadensis Leaf Juice Powder*, Limonene, Lactic Acid, Linalool, Citronellol, Citric Acid, Tocopherol.